Do you have time for God? It is so easy to get so busy that we don’t have time for God. This says that God gives us everything we need to live godly lives. That includes time. So if we are “too busy” then we have no-one to blame but ourselves. These days we live such fast paced lifestyles we leave no margin in our lives. We are so busy…yet what are we busy with? And why are our schedules packed? Why do we feel the need to over-commit and schedule out any time with God or His people? Oftentimes, I know in my life, its pride. I want to please others and so I say “yes” when I should say “no”. I am guilty of pleasing men rather than pleasing God. How about you? Why are you so busy? Spend some time praying about this and see what God answers. Remember that “Anyone who knows the good he ought to do and doesn’t do it, sins.” (James 4:17). A tight schedule that leaves no time to do the things you know you should is sin. However, “No temptation has seized you except what is common to man. And God is faithful; he will not let you be tempted beyond what you can bear. But when you are tempted, he will also provide a way out so that you can stand up under it.” ( 1Cor 10:13). And also, “If any of you lacks wisdom, he should ask God, who gives generously to all without finding fault, and it will be given to him.” (James 1:5). Therefore, ask God to give you the wisdom to say “no” at the right time. Ask him to help you with your schedule so you can prioritize time with Him. “Seek first His kingdom, and His righteousness, and all these things will be given to you” (Matt 6:33). Last week we played a set of songs while reading Psalm 33. We started with a reading, then played part of “Unfailing Love” then read more of the psalm and played “What Can I Do” then read even more and transitioned to “Mighty to Save” then read the rest of it and finished off with the ending of “Unfailing Love”. The songs went with the words that were spoken in the Psalm. The music never stopped, but got soft as the Psalm was read then transitioned to the next song. I was amazed at how God used that time of worship. He truly showed up, and people were really worshipping Him. I am so blessed to have such a great God watching over and loving me. Yet I am humbled knowing that without Him, I could do none of this. Follow-up to: Trying Out a Different Setup: Service in the Round. We tried a new layout for our service last Sunday evening for our “Leadership Community” special service. It was very different. The first noticeable thing was the intimacy. 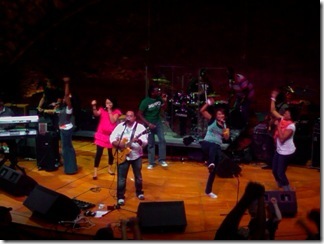 When I was leading worship, I was so close to the worshippers, I could really relate to them. It felt more like I was worshipping with them than before. At the same time, I also felt more like a shepherd, pointing them to God than when I was on a stage in front. 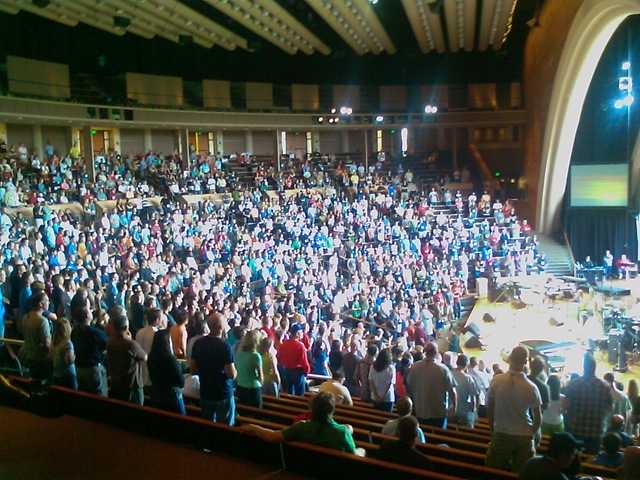 It was very inspiring to see each person worshipping. It required me to turn in different directions to include the whole congregation. This was nice. It encouraged movement on the platform, and the movement was very natural. Some people disliked the fact that, while on the center stage, someone was always looking at their backside. Not intentionally, mind you, but when you have people are all the way around you, your back half is always going to be facing someone. It didn’t bother me much, but others were a bit uncomfortable. A big disadvantage of having someone behind you is that they are unable to see your face as you speak or sing. And if you are not intentional about including everyone equally, one part of the congregation can easily feel neglected. In our case, what would normally have been the front left quarter of the room, was to the backside of the speaker about 90% of the time. They just never looked in that direction for some reason. Since people were in a circle, they were facing people on the other side of the circle. Having the people face one another was very good for community. You got to really see the other people in the congregation. This could help faces quickly become familiar. More importantly, you can hear the other half of the congregation singing back at you…which is a great encouragement to sing yourself. I feel it would help song participation. All in all, I really liked the layout. We are considering doing a 3 sided stage instead for the next time. More like an elongated stage coming out from the main one. This way your backside can still be to the wall, and we can still get in intimate setting. We’ll see how it goes. We have been thinking of trying a different physical layout for our church service where the stage is in the center. We decided to try it out this weekend (tonight) for our “Leadership Community” service. This is a service we have every quarter to encourage those in ministry, and let everyone know where the leadership feels called to go with the church. This requires the worship team to be on the ground (the yellow circles) and only the vocalists on the platform. This would only work well with multiple vocalists so the worship leader’s back is not to part of the congregation. I’ll post after the service and let you all know how it went. 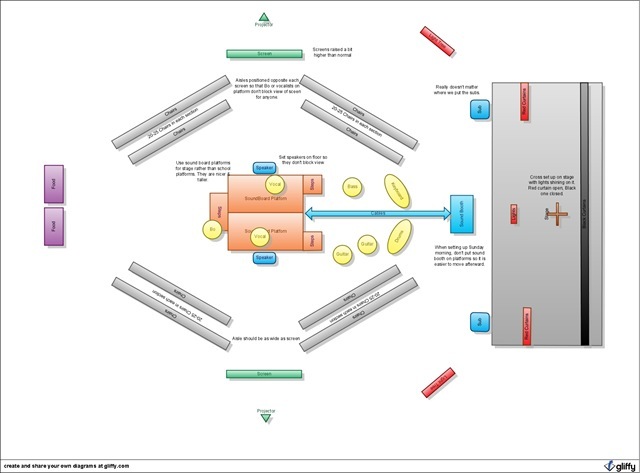 By the way, the image was drawn using Gliffy (www.gliffy.com) which is a great tool for doing Visio-style diagrams on the web. Check it out, its free to try. I’m currently going through the book of Exodus. In chapter 3, Moses sees the burning bush and determines to go see what it is. Then, verse 4 says, “And when the Lord saw that he turned aside to see, God called to him out of the midst of the bush…” God didn’t call out to him till he had turned aside and drew near. I can’t help but think that God shows us a glimpse of Himself often, yet we never turn aside and take the time to draw near to Him. We are either too busy, or not watching. This verse really made me think of when Jesus came to the disciples walking on the water in the midst of the storm. “…and about the fourth watch of the night he cometh unto them, walking upon the sea, and would have passed by them. But when they saw him walking upon the sea, they supposed it had been a spirit, and cried out” Mark 6:48-49 (emphasis added). Jesus “would have passed by them” had they not cried out. What does this teach us? As I read further in Exodus 3, I came to verse 7, “And the Lord said, I have surely seen the affliction of my people which are in Egypt, and have heard their cry by reason of their taskmasters; for I know their sorrows”. God saw their affliction. He knew what was happening to them. He knows all. However, it appears that the motivation for Him to act was their cries to God. As long as we remain silent, how can we expect help? God knows your suffering. He knows everything you need before you ask for it. Are you crying out to God? Are you drawing near to Him? Don’t let Him pass you by. Call out and draw near. He is faithful. 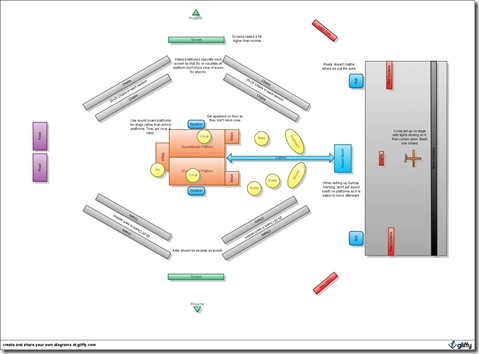 Do You Have a Planning Meeting? One of the most useful and meaningful meetings I have all week is on Tuesday morning when I meet with Bo (my pastor) to discuss last Sunday and plan for the next. When we are unable to have this meeting, I feel as though the rest of the week is very disorganized and difficult. It brings me peace to know that the plans I have made line up with the plans Bo has made. Our meeting starts off with a review of last week: What good things should we keep on doing? “The quiet guitar picking during the prayer really worked well.” or “The comments you made during the middle of that song really helped the congregation contemplate what Christ has done for us.” What things can we do better? “The volume on the vocals was too low.” or “There was too much dead time between songs, it would be nice to flow better between them.” Then we proceed to plan for the next week (or two). Bo and I are not the only ones in this meeting. We invite anyone on the team to participate if they choose, and we also invite others who we feel are able to give good feedback or contribute good ideas for the service. We recognize that we need others to offer constructive criticism and ideas. The meetings have really made a difference in the quality of services we have each week. I would encourage you to meet with your pastor each week, or at least communicate via email or phone to discuss the previous week, and plan for the next. It has truly helped us. Are You Underestimating The Value Of Hymns? Are you underestimating the value of hymns? I did. But now I have seen the light. We planted our church just over a year ago. During that time I only scheduled hymns occasionally. To be honest, I always feared them for several reasons: The chords were extremely difficult to play. The words (i.e. “Thy”, “Thee”, “Fount”, “Ebenezer”, etc.) seemed so antiquated and confusing. They just weren’t the latest “new shiny thing”. But most of all, I wasn’t familiar with most of them. I was wrong. If you look at the reasons I didn’t schedule them more often, each one comes back to me. What is easier for me? What type of lyrics ministered to me? Was I getting to play those new songs everyone else was playing? What music was I familiar/comfortable with? All of these are the wrong criteria for evaluating what songs to select for the congregation God has put in my care. At the National Worship Leader Conference I attended a session by Buddy Owens (Pastor of Spiritual Growth at Saddleback Church) called “Creating a Culture of Worship”. One of the biggest things I learned during this talk is that songs become a part of the people who sing them. Think about the music of your high school days: It brings back many memories. When you hear it, it puts you in that frame of mind. That music is a part of you. Hymns are the same way. But the memories they invoke for those who have sung them in the past are memories of worshipping God. It puts them in a worship frame of mind. Isn’t that what we are supposed to be doing? I also have been reading Worship Matters: Leading Others to Encounter the Greatness of God by Bob Kauflin and Paul Baloche. From it, I have realized that the music I select will affect the beliefs of the congregation God has placed under my care. The congregation is going to remember the words and take them as truth. What truth am I choosing to put in them through the music I choose? And is it true? Hymns are deep with truth. Some contemporary songs are as well, but hymns are historically deep with teaching and theology. The book made the comment that your iPod is a poor place to select songs from. Its not about the musical feel, but the lyrical content. Check the content first, without the music. If you just wanted musical feel, you could pick whatever secular songs are popular and call that worship. It doesn’t work that way. So for the last two weeks, I have started including hymns in our services. The first week was an amazing time of worship, for that, and for other reasons. This last week was great as well. We played “Great Is Thy Faithfulness” and I was blown away by how loud the congregation sang. I could barely hear them through the other songs, but when we hit that hymn, it was as if everyone decided to sing loud! My wife was in the congregation and observed a lady near here weeping with tears of joy! It affected the congregation a lot. I stand humbled. Worship is not about what I like. Its not about me at all. Its all about God. Its about bringing praise and glory to the creator of the universe. Get to know your congregation, not just those your age, but the older people as well. How can your song selection help ALL of them to worship God more fully? Do not deprive any segment of your congregation with the opportunity to worship in a way that fully engages them. If hymns honor God, don’t neglect them. And don’t underestimate their value based on your own preferences. I am about halfway through reading this book, and I wish it had been around when I started leading worship. I cannot say enough good things about this book. It really puts worship and your role as a worship leader into proper perspective. If you lead worship, you really should read this book. Heck, even if you don’t like to read, read it anyway. It’s worth your time. I have realized lately that God has been putting me in situations where I have to exercise leadership skills that I am very weak in. This is happening both in ministry, and at work. I realize that I need to be working on my weaknesses. If I know I am weak in a certain area, that is where I need to focus my efforts to improve. I would encourage each of you to focus on strengthening your character in the areas it is most weak in. Make sure you ask God for His help or your efforts will be in vain. The unchanging God seeks to change us sinners to be more like His son Jesus Christ! 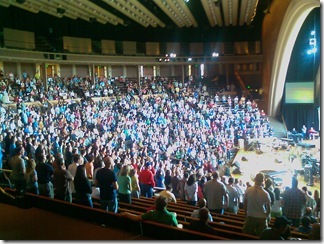 Last week I attended the National Worship Leader Conference here in Austin, TX. It truly was a blessing. I started the conference on Monday feeling burned out and weary. By the closing night (Thursday) I felt so recharged and ready to lead worship on Sunday. That Sunday was by far, the most worshipful and God-encountering worship service we have had at our church so far. God truly used the conference to bring himself honor and praise. Over the next few weeks, I will be posting on many of the things I learned in an attempt to help the few of you who read this blog to help your congregations draw nearer and nearer to God. The two sessions I found most useful were: Creating Flow with Paul Baloche and Creating a Culture of Worship with Buddy Owens. They really changed the way I approached leading worship and choosing songs. I am excited to share what I learned in the next few posts. 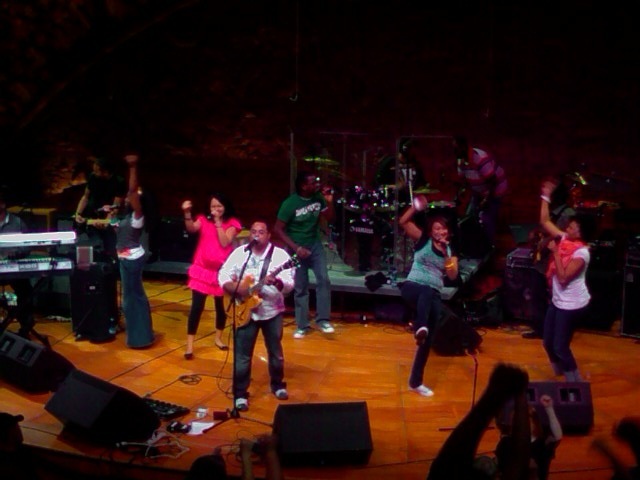 Below is a picture of the closing night with Israel Houghton. God bless you and His church!